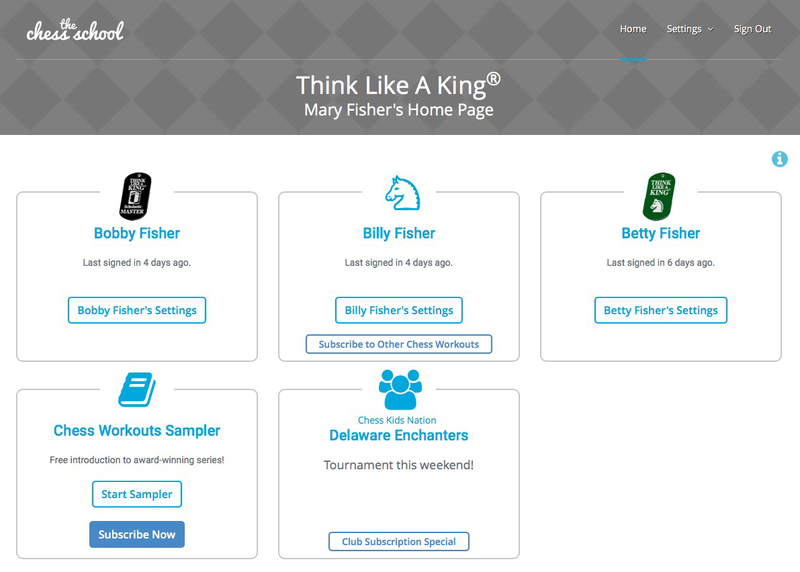 Think Like A King® was designed from the ground up to be about more than just chess. Don’t tell your kids, but the secret is that it will help them learn the thinking skills they need to be successful in school—and in life! Chess Workouts™ will certainly help kids learn chess. But at the same time, they help build reading, vocabulary and critical thinking skills – all while being highly engaging. As they go through these unique tutorials, children don't just learn chess, they learn to Think Like A King for the rest of their lives. Audio narration, included in the first three Chess Workouts, means that even early readers get the full benefit from these great learning tools. Unlike most other online chess systems, we’ve built ours with the whole family in mind. Parents can follow each child’s learning progress and club activities – and even get free access to the whole curriculum for themselves, so chess can be a true family activity. Make chess a perfect way for everyone to bond – over great thinking! Parents use their own ‘Family Page’ to see each child’s progress through the system. If your child is a member of a chess club that uses the system, you see any messages or learning assignments the coach may send. And when your kids (or their chess club!) subscribes to the Chess Workouts you get access to them for FREE – so you can keep up with your kids in chess! A perfect opportunity for bonding, togetherness, and being the role model that shows your kids how important great thinking skills are!